Covering deficiency in service in areas relating to unauthorized/erroneous debit, non-execution/delayed execution of debit/credit NEFT/NECS/ECS/NACH transactions, issuance of ATM/Debit Cards without written consent of customers, Payment of Cheque after acknowledgement of Stop Payment Instructions/ Non-blocking of lost ATM card, delay in collection of local /outstation cheques and cheques drawn on foreign countries, delay in Pension Payment, delay in issuance of duplicate IOI, etc. 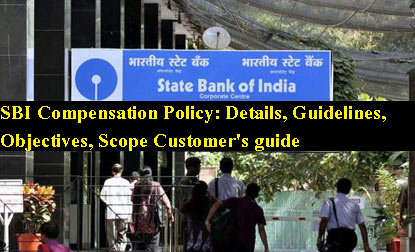 The objective of the "State Bank of India Compensation Policy (Banking Services)" (hereinafter called the Policy) is to establish a system whereby the Bank compensates the customer for the loss or inconvenience due to deficiency in service on the part of the Bank or any act of omission or commission, directly attributable to the Bank. In order to increase efficiency of operations/better performance and to compensate adequately any customer who faces deficiency in services, the Compensation Policy for the Bank has been formulated. Technological progress in payment and settlement systems and qualitative changes in operational systems and processes undertaken by various players in the market have improved efficiencies for providing better services to the users of the system. It has been the endeavour of the Bank to offer services to its customers with best possible utilization of its technology infrastructure. Migration of all branches to Core Banking Solution (CBS) platform is a great leap in this direction. Reserve Bank of India has also been issuing various instructions/guidelines, from time to time, with a view to improving the level of customer service available to the customers of the banking industry and also to empower the banks to promote efficient service. Accordingly, In order to increase efficiency of operations/better performance and to compensate adequately any customer who faces deficiency in services, the Compensation Policy for the Bank has been formulated. a) The Policy will be applicable to all banking services to customers of the Bank. b) The Policy is based on principles of transparency and fairness in the treatment of customers. It is designed to cover deficiency in service in areas relating to unauthorized/erroneous debit, non-execution/delayed execution of debit/credit NEFT/NECS/ECS/NACH transactions, issuance of ATM/Debit Cards without written consent of customers, Payment of Cheque after acknowledgement of Stop Payment Instructions/ Non-blocking of lost ATM card after acknowledgement of request for its blocking, delay in collection of local /outstation cheques and cheques drawn on foreign countries, adverse movement in exchange rates, loss of cheques/instruments in transit, delay in settlement of disputed ATM transactions/transactions on Cash Deposit Machine, delay in Pension Payment, delay in issuance of duplicate IOI, delay in release of securities after payment of all dues, deduction of TDS after submission of form 15G/15H, delay in release of pension after submission of life certificate etc. as specified in this Policy. c) Grant of compensation under this Policy is without prejudice to the Bank's rights in defending its position before any Court of Law, Tribunal or any other forum duly constituted to adjudicate banker customer disputes and does not constitute admission of liability or any other issue, of any nature whatsoever, for the purposes of Adjudicatory proceedings. If the Bank has raised an unauthorized/ erroneous debit to an account, the entry shall be reversed with value dated credit to deposit/overdraft/loan account immediately on being detected/informed, after due verification. Further, if the customer has suffered any loss incidental to return of a cheque or not carrying out of direct debit instructions due to insufficiency of balance on account of the unauthorized / erroneous debit, Bank will compensate the customer to the extent of such financial loss in addition to an amount equivalent to interest calculated on the unauthorized/erroneously debited amount at applicable Savings Bank rate, minimum Rs.100/-, besides refunding the cheque return charges. In case verification of the entry reported to be unauthorised /erroneous by the customer does not involve a third party, the Bank shall arrange to complete the process of verification within a maximum period of 7 working days from the date of reporting of erroneous debit. If it involves a third party or where verification is to be done at overseas centres, the Bank shall complete the verification process within a maximum period of one month from the date of reporting of unauthorised /erroneous transaction by the customer. In case any amount has been debited to the account of a customer on account of fraudulent transactions, the amount will be restored to the affected customer account without delay/demur, once the fraud is established, with due verification. If a fraud, in the account of a customer, has been committed by a member of staff, and has been so established, the Bank will not only restore the amount, it will also pay compensation @ 1% above the applicable interest rate in respect of deposit/overdraft/loan account, for the period, on the amount involved. In case where neither the Bank is at fault nor the customer, but the fault lies elsewhere in the system, the Bank will help in restoring the actual amount involved and, as a gesture of goodwill & to deal with the customers fairly, will also compensate the customer with Rs.100/- per Rs.5000/- (maximum Rs.1000/-) for each instance. The Bank undertakes to carry out, within the prescribed time, direct debit /ECS (Electronic Clearing Service) debit instructions of customers. In the event of non-compliance/delayed compliance of instructions by the Bank to meet such commitments, the customer will be compensated to the extent of any financial loss the customer would incur on account of delay in carrying out the instruction/failure to carry out the instruction. Such compensation may be equivalent to the interest calculated on the amount to be debited, for the delayed period, at applicable Savings Bank rate, with minimum of Rs. 100/-, subject to a maximum of Rs.1,000/-. The Bank would debit the customer’s account with any applicable service charge as per the schedule of charges notified by the bank. In the event the Bank levies any charge in violation of the arrangement or inadvertently, Bank will reverse the charges, subject to scrutiny of agreed terms and conditions, and compensate the customer with a sum equal to the charges reversed. Destination Bank would be held liable to pay penal interest at the current RBI Repo Rate plus two per cent from the due date of credit till the date of actual credit for any delayed credit to the beneficiary’s account. Penal interest shall be credited to the Beneficiary's Account even if no claim is lodged. In the event of any delay or loss on account of error, negligence or fraud on the part of an employee of the destination bank in the completion of funds’ transfer pursuant to receipt of payment instruction by the destination bank leading to delayed payment to the beneficiary, the destination bank shall pay compensation at current RBI Repo Rate plus two per cent for the period of delay for credit to the beneficiary’s a/c. In the event of delay in return of the funds’ transfer instruction for any reason whatsoever, the destination bank shall refund the amount together with interest at the current RBI Repo Rate plus two per cent till the date of refund. During the NEFT operating hours, originating banks should endeavour to put through the requests for NEFT transactions received by them, either online or across the counters, preferably in the next available batch but, in any case, not exceeding two hours (from the business hours next day), from the time of receipt of the requests. In the likelihood of any delay / possible delay in adhering to this requirement, the originators / customers should be informed of the delay / possible delay and the reasons for the same. In terms of the RBI ECS (Credit Clearing) procedural guidelines, which clearly stipulate that if a destination bank branch is not in a position to credit a particular transaction for reasons like "Account Closed/ transferred"; "No such Accounts"; "Account description does not tally"; etc., it should report the same and forward it to the Service Branch/ Main Branch on the same settlement day. Where the Bank had issued an ATM / Debit card without written consent of the customer, which has been disputed by the customer without using the card, the said ATM/Debit card will be taken back by the Bank and cancelled. The Bank would reverse the charges, if levied. The instruction for Stop Payment of cheque/ blocking of lost ATM card will be accepted at Home Branch /through Contact centre/ Internet Banking (alternate channel). In case a cheque has been paid after acknowledgement of its stop payment instruction /ATM Card has not been blocked after such a request has been acknowledged by the Bank, Bank shall reverse the debit on account of stopped cheque/ blocked ATM card with value dated credit within two working days of the customer intimating the transaction to the Bank, and also compensate the customer with Rs.100/-. However, no compensation will be paid if cheque has been paid/ ATM Card transaction has occurred prior to acknowledgment of instructions for stop payment of cheque/ blocking of lost ATM Card. 1. The Bank would not compensate the customer for delays in collection of cheques drawn on banks in foreign countries as the bank would not be able to ensure timely credit from overseas banks. It is the bank’s experience that time for collection of instruments drawn on banks in foreign countries differs from country to country and even within a country, from place to place. The time norms for return of instruments cleared provisionally also vary from country to country. 2. Delay in collection of cheques payable at foreign centres will be construed if the customer’s account is not credited within 10 working days, excluding Saturdays, from the date of clear credit to the Bank's Nostro account, i.e. after taking into account the prescribed cooling period for that currency, with the correspondent. i) At Savings Bank rate, if the period of delay is beyond prescribed collection period, i.e. after 10 days from the cooling period (as mentioned in Para 4.6.2 above) and upto 45 days, where proceeds of the instruments are to be credited to deposit accounts. ii) In case of abnormal delay, i.e. delays exceeding 45 days, interest will be paid at term deposit rate applicable for the period and for delays beyond 90 days, 2% above the applicable term deposit rate. iii) In the event of the proceeds of cheque under collection being required to be credited to an overdraft / loan account of the customer, interest will be paid at the rate applicable to the loan account, if the delay is upto 45 days. For abnormal delays, i.e. beyond 45 days, interest will be paid at the rate of 2 % above the applicable interest rate to the loan account. Such interest shall be payable with a minimum of Rs. 25/-. 1. FEDAI Rules No.2.B.3 and 4.A.3 (amended as on 27th June, 2007) provide for compensation for delayed collection of export bills/payment of foreign inward remittances etc. and also for adverse movement of forex rates and for payment of interest for delay in payment to the exporters on export bills sent for collection and realized by the authorized dealers. 2. On the assumption that the customer has complied with FEMA guidelines and Bank's requirements, the following Compensation guidelines are prescribed. i) In case the rate ruling on the date of payment is better for the customer compared to the rate that was ruling on the day the amount was due for credit, no compensation needs to be paid. ii) In case the rate ruling on the date of payment is adverse for the customer compared to the rate that was ruling on the day the amount was due for credit, compensation shall be determined as 50 % of the difference between the two rates. Note: If the exporter has expressed willingness to keep part of the proceeds in EEFC A/c, no compensation would be payable for the amount not converted. ii) There is an adverse movement of exchange rate between the date of payment and the last due date. iii)The quantum of compensation would be determined as 50 % of the difference between the rates ruling on those dates (i.e. on the due date of payment and the date of conversion). a) Saving Bank rate for the period of delay beyond 7/10/14 days, as the case may be, in collection of outstation cheques, i.e. from 8th /11th /15th day, the interest will be payable. d) In the event the proceeds of cheque under collection, to be credited to an overdraft / loan account of the customer, interest will be paid at the rate applicable to the loan account. For extraordinary delays, i.e. delays exceeding 90 days, interest will be paid at the rate of 2% above the rate applicable to the loan account. 3 Interest as above shall be payable with a minimum of Rs.25/-. Such interest shall be paid without any demand from customers in all types of accounts. There shall be no distinction between instruments drawn on the bank’s own branches or on other banks for the purpose of payment of interest on delayed collection. 1. Cheques deposited in the drop-box upto 11 A.M. will be sent for clearance on same day, for which the clearance period will be T+1 working days. Cheques deposited after 11 A.M. will be sent for clearing on next day, for which clearance period will be T+2 working days. 2. The compensation to the customers is payable in case of delay in clearance of local cheques beyond above stipulated period in all types of accounts at Savings Bank interest rate. 3 Bank shall also permit usage of the shadow credit afforded to the customers’ account immediately after closure of relative return clearing and withdrawal may be allowed on the day of affording shadow credit or maximum within an hour of the commencement of business on the next working day, subject to usual safeguards. 1. In the event a cheque or an instrument accepted for collection is lost in transit or in clearing process or lost by the Service Provider ( in case of CMP), the Bank shall immediately, on coming to know of the loss of instrument, bring the same to the notice of the account holder so that the account holder can inform the drawer to record stop payment and also take care that cheques, if any, issued by him/her are not dishonoured due to non-credit of the amount of the lost cheque/instrument. The Bank would provide all assistance to the customer to obtain a duplicate instrument from the drawer of the cheque. 2. In case intimation regarding loss of instrument is conveyed to the customer beyond the time limit stipulated for collection, as per the Cheque Collection Policy of the Bank, (7/10/14 days as the case maybe) interest will be paid for the period beyond the stipulated collection period at the rates specified in para 4.8.2 above for cheques payable in India and at rates specified at Para 4.6 above in regard to cheques payable abroad. i) Bank will pay interest on the amount of the cheque for a further period of 15 days at Savings Bank rate to provide for possible further delay in obtaining duplicate cheque /instrument and collection thereof. ii) The Bank would also compensate the customer for any reasonable charges which he/she incurs in getting duplicate cheque/instrument upon production of receipt, in the event the instrument is to be obtained from a Bank/institution who would charge a fee for issue of duplicate instrument, subject to a maximum of Rs. 250/-. 1. RBI’s instructions/guidelines stipulate that the time limit for resolution of customer’s ATM complaints by the issuing banks is 7 working days from the date of receipt of customer complaint. Accordingly, failure to re-credit the customer’s account within 7 working days of receipt of the complaint shall entail payment of compensation to the customer @ Rs.100/- per day by the issuing bank, provided the claim is lodged with the issuing bank within 30 days of the date of transactions and branch has failed to establish the proof of payment/disbursement by ATM. 2. In case of dispute in regard to delayed credit to the customer’s account from Cash Deposit Machine (CDM), the Bank will pay the interest at the applicable rate of the customer’s deposit/overdraft/loan account for the delayed period, after due verification. However, in case of any dispute related to genuineness of the currency deposited in the CDM, it will not be covered under Bank’s compensation policy. 1. As per RBI instructions, pension (normal pension) of Central / State Govt. pensioners should be credited to their account on any of the last four working days of each month, except the pension for March every year which will be credited on the first working day of April. 2. As regards disbursing revised pension / arrears, pensioners should get the revised pension / arrears on the last day of the succeeding month, after the month in which the concerned Government announces the revision and date for implementation. In other words, each Agency Bank is getting adequate reaction time ranging from 30 to 60 days to obtain the revised parameters from the respective Government department and implement the same in time. 3. The concerned pensioner should be compensated for delay beyond the due date (last date of the succeeding month subsequent to the month of issue of order by the concerned Government department) at the rate of 8% (fixed rate) on the revised pension / arrears for the delay period. This compensation shall be credited to the pensioner’s account automatically without any claim from the pensioner in respect of all delayed pension payments made since October 1, 2008. 4. In case of very complicated pension cases requiring reference back to the respective Government / govt. departments, the due date would commence from the date of obtention of final clarification from the Government concerned. 5. Timely submission of Annual Life Certificate by Pensioners before 27th of the month is required for uninterrupted Pension payment. Pension should restart by last day of the same month (due date-I) subject to compliance of all other applicable regulations, Otherwise latest by last day of next month (due date-II).If the pension is credited beyond due date-II, the pensioner may be compensated for the delay beyond due date-II at the rate of 8% fixed rate on the pension/arrears for the delay period. Duplicate IOI will be issued within 5 working days from the receipt of such request from the purchaser thereof. In the event of any delay beyond 5 days, a compensation of Rs.100 will be paid. 1. Bank will not pay any compensation, to the cheque holder, for dishonour of "at par" cheques issued by other banks, including co- operative banks, in the absence of adequate funds in the account on which cheques are issued even though the amount of the cheque may have been paid to the bank, which had issued the "at par" cheque. 2. RBI instructions stipulate that banks will not honour cheques drawn on current accounts maintained by other banks with it, unless arrangements are made for funding cheques issued. Issuing bank shall be responsible to compensate the cheque holder for non-payment of cheques in the absence of adequate funding arrangement. The Bank has adopted the principles of “Lenders’ liability”. In terms of guidelines for “lenders’ liability” and the “Code of Bank’s commitment to customers” adopted by the Bank, the Bank would return to the borrowers all the securities /documents /title deeds of the mortgaged property within 15 days of repayment of all dues agreed to or contracted, subject to any other right/lien/claim by the Bank till the relevant claim is settled /paid. If any right to set off is to be exercised for any other claim, Bank shall give due notice with full particulars about the other claims and retain the securities/documents/title to mortgaged property till the relevant claim is settled/paid. In the event of loss of title deeds to mortgaged property at the hands of the Banks, the compensation will cover out of pocket expenses for obtaining duplicate documents on actual basis subject to a ceiling of Rs.5000/- plus a lump sum amount, as decided by the Bank in the following manner “The Bank would pay the compensation for delay in return of securities/documents/title deeds of the mortgaged property beyond 15 days of repayment of all dues agreed to or contracted, subject to above conditions, @ Rs.100/- per day (maximum Rs.5000/-) to the borrower”. In the event of receipt of any complaint from the customer that the Bank’s representatives/couriers/any other agent (DSA) either engaged in any improper conduct or acted in violation of the Code of the Bank’s commitment to customers which the Bank has adopted voluntarily, the Bank shall take appropriate steps to investigate and redress the complaint and endeavour to communicate to the customer within 7 working days from the date of receipt of complaint and, where justified, may compensate the customer suitably for financial loss as decided by the Bank. Also, necessary steps will be taken, if required as per Bank’s decision, to prevent recurrence of similar complaints. The amount of compensation for deficiencies in various categories of Banking Services as mentioned in this Policy should be paid to the customers within 15 (fifteen) days after the deficiency is acknowledged. With implementation of new functionality (TDS Module) in CBS as per the directives of CBDT, the probability of error in deduction of tax after submission of Form 15G/15H do not exist. Moreover, the customer has a recourse to get refund of tax deducted erroneously by the Bank, if any, from Income Tax Department. In such cases, Bank will provide help by issuing required certificate, if any, free of service charges for getting refund from I.T. Dept, along with compensation by paying interest on the amount involved at the SB rate (Min. Rs.100/-) from the date of deduction of tax to the date of receipt of Refund from I.T. Deptt on submission of copy of I.T Assessment order, after deducting the amount of interest paid by I.T Department, if any. The amount of compensation paid at the branch shall require post facto approval by the controller of the branch who shall in turn put up Control Report to his controllers. IT-CBS Development department has developed the necessary functionality related to automation of payment of compensation for the following deficiencies in CBS and rolled out the same since November, 2013. Detailed operational guidelines in regard to payment of compensation to the customers on account of deficiencies in the services have been circulated by way of e-Circular No. : NBG/BOD-GB/70/2014 – 15 dated 05th November, 2014. Issue of ATM / Debit cards without written consent of customers. Payment of cheques after acknowledgement of stop payment instruction at Home Branch. Compensation for delayed collection of export bills / payment of foreign inward remittances etc., adverse movement of forex rates and also payment of interest for delay in payment to the exporters on export bill sent for collection and realized by authorized dealers. Delay in issuance of duplicate IOI. 1. Bank will not be responsible for the loss to the customers due to customer’s carelessness in keeping the Cheque book, passbook, cards, PIN or other security information and not following “Do’s and Don’ts” issued by the Bank, until the Bank has been notified by the customer. 2. The Bank will not be responsible for the loss to the customer, if the customer acts fraudulently and/or acts without reasonable care which has resulted in loss to him/her. Bank will also not be responsible for the losses arising out of misuse of lost PIN, compromise of passwords or confidential information, until the time the Bank has been notified of such loss/compromise and has taken steps to prevent its misuse. i) Any deficiency in regard to loans and advances activities of the Bank. ii) Dishonour of at par payment agreement with other banks, due to non- funding and security compliance. iii) In case of delay on account of non-functioning of business due to factors beyond the control of the bank the period covered by such events shall be omitted for calculation of delay etc. iv)Where the issues are sub-judice and pending before Courts,Ombudsman,arbitrator,Government and matter put on hold due to stay. The Bank shall not be liable to compensate customers under this Policy if some unforeseen event including but not limited to civil commotion, sabotage, lockout, strike or other labour disturbances, accident, fire, natural disasters or other “Acts of God", war, damage to the Bank's or its correspondent bank(s) systems, communication channels etc. beyond the control of the Bank, prevents it from performing its obligations within the specified service delivery parameters. 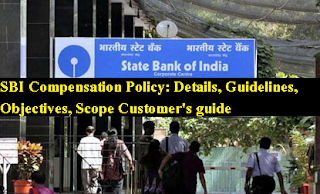 State Bank of India Compensation Policy: Details, Guidelines, Objectives, Scope, compensation on Unauthorized / Erroneous Debit, ECS direct debits, Uniformity in penal interest payable by banks for delays in credit/return of NEFT/NECS/ ECS transactions, Issue of ATM/Debit Cards without written consent of customers, Collection of cheque drawn on foreign countries etc.